What started out as a group of friends who regularly dined out together became something more when I had an idea to find the best burgers in NYC. Just like that, the Gotham Burger Social Club was born. We’re now NYC’s premier burger club -- made up of 15 gentlemen who appreciate a great craft burger as well as old-school classics -- and have been covered by news outlets including FOX5, CNBC, CNN, and the New York Post. Our mission is simple: discover the best burgers and have a lot of fun while doing it! 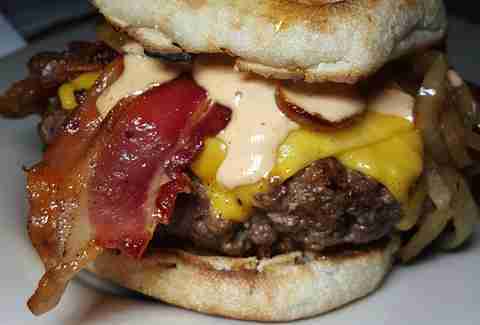 Here, we highlight some of the city’s most underrated, but deliciously well-deserving, burgers. You know what to do. Steps away from the Barclays Center is an unassuming grill owned by the people behind the famous Franny’s. This spot is serving up an under-the-radar juicy burger that’s cooked using a wood-fired grill, adding a great charred flavor to the beef patty. It’s simply prepared with a swipe of mayo and pickles, and be sure to add Gruyère cheese for an extra buck (it’s the smart thing to do). Also, don’t forget to order some of Rose’s monster onions rings on the side. 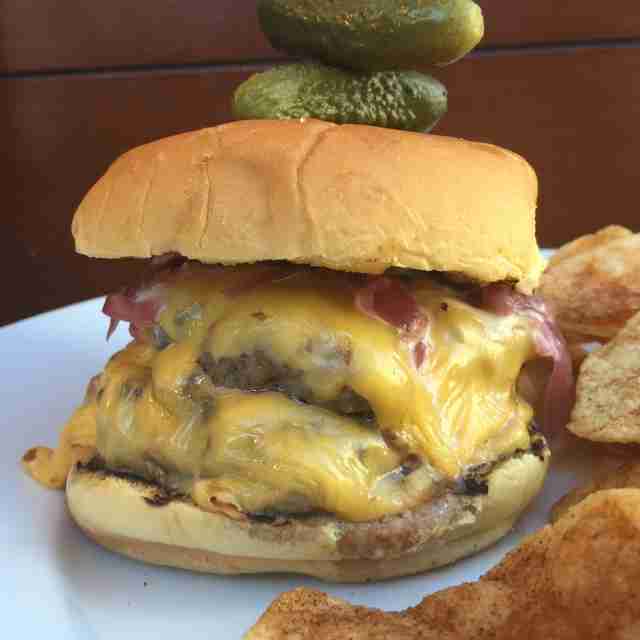 Known for putting an elevated twist on comfort food, Chef Michael Ferraro has nailed the classic bacon cheeseburger. Loaded with melted cheese, crispy bacon, and sweet caramelized onions, this beefy burger is executed perfectly. Go devour it outside while watching the beautiful SoHo crowd walking by -- but leave your skinny jeans at home because you’ll want to start with an order of crispy, gooey cheeseburger spring rolls. This was one of RFK Jr’s favorite hangouts and it should be yours, too. 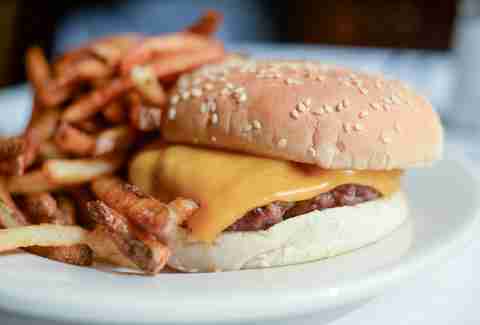 Walker's is an NYC institution has been serving this burger since 1987, long before anyone started taking pictures of their food. It’s everything you want in an unpretentious 8oz juicy sirloin burger. Served simply with LTO, the cheese of your choice, and the option to pile on crispy bacon, or spicy chili. There are no wrong answers here. 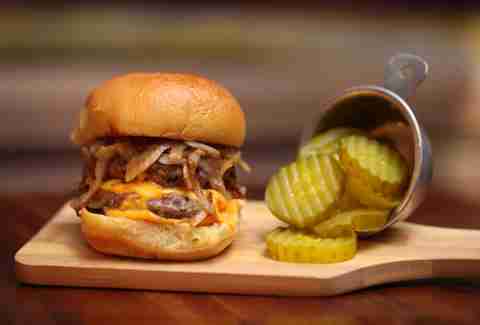 Belly up to the bar, order your burger, inhale it, and wash it down with some American whiskey, damn it! Established in 1922, Sanfords has evolved with the times and is now serving up great craft organic burgers loaded with flavor. This restaurant, known for contemporary comfort food, makes it difficult to single out one burger. But locals love the Prime Beef Bistro Burger. 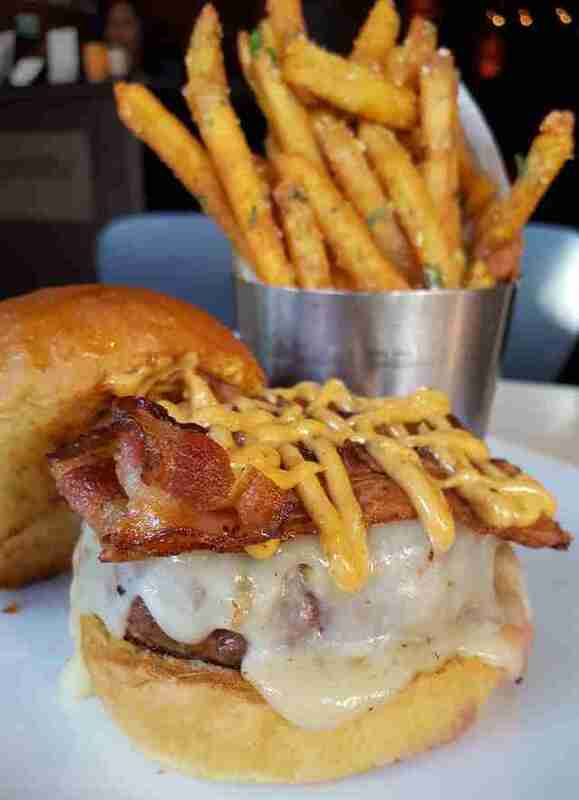 Cooked on a charcoal grill, it’s topped with thick cut Applewood bacon, spicy pepper jack cheese, and Cajun aioli. Local Parisi Bakery supplies a challah roll that adds a little sweetness to balance out the spice in the cheese and aioli. Anyone who knows us knows our love of great burgers and great bourbons, and this spot nails both, as they showcase one of the finest whisky collections we’ve seen. There is only one reason to head over to Mark -- to inhale the perfect slider. Many spots claim to serve sliders, but most are actually serving mini versions of burgers. This place is cooking up real proper sliders that are smashed thin, griddled with onions, and served on a soft, slightly sweet Martin’s potato roll. Order up a single or a double with cheese -- and don’t forget to add bacon. We guarantee you can’t eat just one. 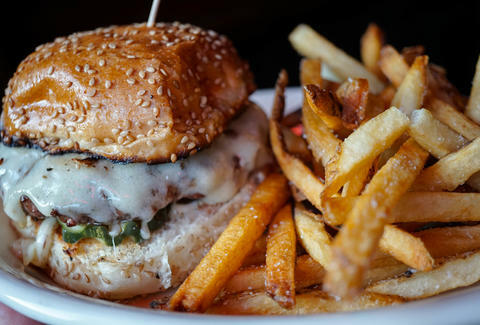 We never thought we’d say this, but you can find an amazing craft burger at an Italian restaurant (our grandmothers just rolled over in their graves hearing that). This lunchtime burger is one to savor. 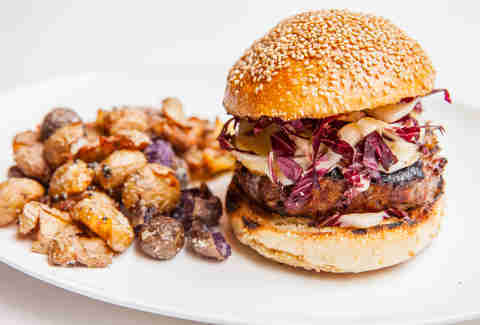 The rich short rib blend pairs perfectly with the truffle cheese, grilled radicchio, and sweet caramelized onions. You might not think to order a burger at a spot known for its bucatini with smoked uni, but you should! 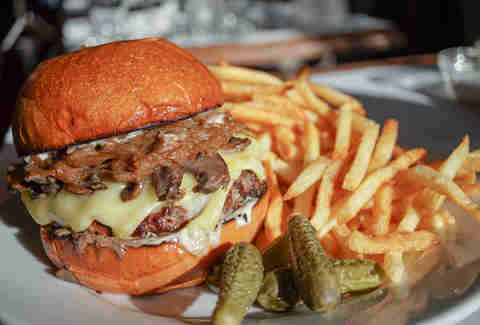 French bistros are famous for escargots and great steak frites, but don’t pass on this mouthwatering burger. The 10oz short rib-brisket blend is topped with some carefully prepared toppings that showcase the rich beef. Jammy caramelized onions, earthy mushrooms, melted Gruyère cheese, black truffle mayo, celery root remoulade, and cornichons bring this masterpiece together. 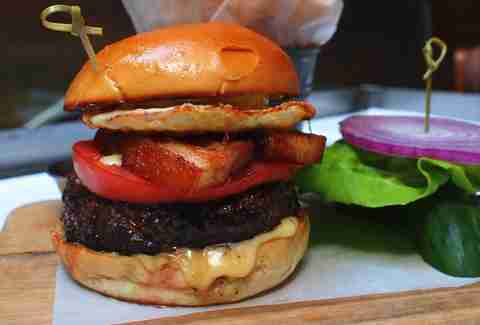 Plain and simple: the French kick our asses in the burger game. Some places are still serving burgers the old fashioned way. Paul’s is the quintessential burger joint cooking up tasty, juicy 1/2lb burgers on a flat top. The beef is seasoned, cooked, and served the way you want, as opposed to how the chef wants you to eat his burger. Order one of the many creations on the menu or customize your own and go crazy with the toppings that are offered -- just don’t forget the special sauce. They'll cook it to order and get that cheese melted perfectly, the way it should be. These old-school burger joints have been disappearing from our city streets, so go and cherish this place. Doug Quinn knows how to bring on the funk with his well-crafted “El Burger” named after the elevated L train that used to travel along 3rd Ave. Made with a custom blend of aged beef, this burger will punch you in the mouth with that rich, nutty, cheesy funk that you expect from a great aged steak. 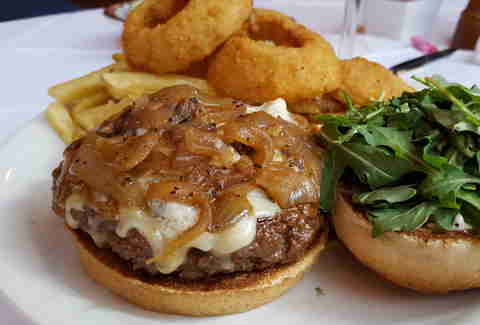 When the beef is this special you don’t monkey around with the toppings, so Doug simply adds sweet caramelized onions and melted cheddar cheese and serves it on a Balthazar brioche bun. When you leave you’ll have to remind yourself that you didn’t just eat a steak! 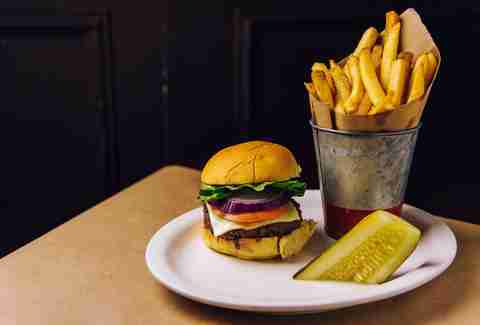 When it comes to the most underrated burgers in NYC, we always think of Ted’s. Known for using sustainable farms to source meat, this spot consistently serves up amazing, flavorful, and juicy burgers. You can order any burger with your choice of bison or beef that is ground in-house twice daily. The patties are loosely formed, placed on a flat top, and cooked to the specific temperature you request (anything past medium is just wrong!). Stick with medium-rare with the bison, as the low fat content will guarantee a dry burger if overcooked. Try the Avalon, which has the perfect combination of salty, peppery, smoky, and sweet from the mix of blue cheese and Gruyère, bacon, grilled sweet onions, roasted garlic aioli, and fresh baby arugula. The only way to improve this burger is to ask for half onion rings and half fries on the side. Inside of the posh Time Warner Center you’ll find a masterpiece created by legendary Chef Michael Lomonaco. This nostalgic-tasting burger reminds you of that fast food-style burger you loved as a kid, but elevated to satisfy your adult taste buds. The “Bar Burger,” aptly named for the burger available at the bar, is a juicy double patty with double American cheese, sweet red onion jam, pickled jalapeños that perk up your senses, and a homemade special sauce (similar to that sauce we loved as a kid on the certain big burger), served on a soft potato roll. You might just think to order a second one and take a stroll down memory lane. Michael Puma is the founder of the Gotham Burger Social Club and loves to share the juicy details of his favorite finds on Instagram -- now almost 100,000 followers strong. Join along on all the beef and whiskey-fueled adventures on Instagram, Twitter, and Facebook.